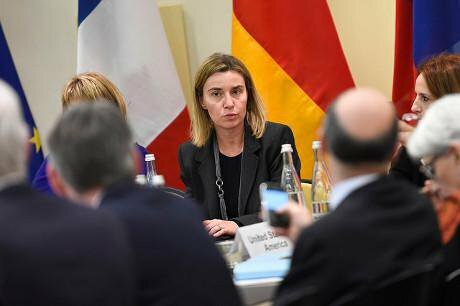 Tense talks: the European Union high representative, Federica Mogherini, during the negotiations in Lausanne. Flickr / EU External Action Service. Some rights reserved. Finally we can breathe a little easier. With the achievement of the provisional, ‘in-principle’ accord between Iran and the US (and the other P5+1 group members), the hope of peace has been kept alive. There is still a long way to go. We must get through the next three months of negotiations, with all the attendant risks, large and small, before this initial, tentative agreement can be turned into a permanent accord. Its opponents are many. On one side we find Israel and the war-mongering military adventurists of the American right, in de facto alliance with the right-wing within Iran’s governing forces. On the other, America’s moderates, led by the president, Barack Obama, and supported by Israeli realist factions, stand together with the reformists within the Iranian regime. But, despite all the threats and ranting of American senators and their Iranian counterparts, the footholds of peace between Iran and the US have been established. President Obama has left his opponents in an exposed position. Despite being subjected to many long decades of intense pressure, Iran succeeded in developing its own independent nuclear programme. Obama says this leaves America with a stark choice: finalise an accord which limits and controls Iran’s nuclear programme or go to war with the Islamic Republic. There is little appetite among the American public for the latter: the latest polls show most Americans oppose war with Iran. Under this agreement, Iran will see its nuclear programme severely cut back and subjected to rigorous controls. For the first time, however, Iran gains formal recognition by the international community of its rights to the peaceful development and use of nuclear power. And, after 10-15 years, the accord and its restrictions will be up for renegotiation. Those who have thrived on the fear of war will have the cutting edge of their arguments blunted by the prospects of peace. Iran has paid a steep price to reach this juncture. In addition to the enormous direct costs of establishing its nuclear industry, to date Iran’s economy has had to cope with more than $100 billion in damages under the current, back-breaking economic sanctions. Iranians hope that this accord will bring to an end the decades of deprivation and isolation they’ve suffered, and that living standards finally will start to improve. On the Iran side, this accord has been made possible only through the dogged determination of Iran’s reformists. This time around, they’ve acted with more courage and tenacity than during the presidency of Mohammad Khatami, and they’re reaping the reward. If the regime’s right-wing factions do not succeed in sabotaging the negotiations, the current president, Hassan Rouhani, will receive the credit for this supreme, highly tangible triumph. But a final accord would have two ramifications of even greater potential significance. Inside Iran, the most far-reaching consequence of such an agreement is the increased possibility of positive change in the public sphere. The spectre of threats by the conspiratorial ‘Big Satan’ against the Islamic Republic has been the Iranian regime’s most important tool in repressing its own people’s rights. The deal under negotiation would weaken this instrument, giving the struggle for increased freedom greater opportunity. Those who have thrived on the fear of war will have the cutting edge of their arguments blunted by the prospects of peace. And from an international perspective the most important consequence of the prospective agreement is the new order it will bring about in the Middle East. Any such agreement will undoubtedly include ‘understandings’ or even formal accords, far beyond nuclear issues, which will remain undisclosed for the time being. Details of these unacknowledged understandings aside, it’s clear that they include recognition of the important changes that have already occurred in the balance of forces in the region. The existing order in the Middle East, established in the aftermath of the first world war, is giving way. Perhaps it’s best to say that this accord signals the beginning of the end of the old order and the start of a transition which, through copious blood and fire, anguish and pain, will certainly issue in a new one. Translated by Linda Heiden, in collaboration with the author, from ‘Tavafogh-e Iran va Amrika: Ruzaneye Solh’, an article which appeared simultaneously on 4 April 2015 in the Persian online publications Asre Now, Irane Ma, Akhbare Ruz and Kar-Online.